For meetings of the Hampton Roads Adaptation Forum, see the dedicated web page at https://sites.wp.odu.edu/HRAdaptationForum/. Hampton Roads Sea Level Rise/Flooding Adaptation Forum: The Summer meeting of the Hampton Roads Sea Level Rise/Flooding Adaptation Forum will take place on July 20, 2018 at the TED Constant Center Multipurpose Room, 4320 Hampton Blvd, Norfolk, VA 23529. The meeting will focus on Designing for Resilience. Registration is open here. 4th Blue Planet Symposium: The 4th Blue Planet Symposium organized by the GEO Initiative "Blue Planet: Ocean and Society" takes place July 4-6, 2018 in Toulouse, France. For more information, see here. Hampton Roads Adaptation Forum: A HRAF mmetting took place on February 23, 2018 at the Hampton Roads Sanitation District NS Training Facility, 2389 G Avenue, Newport New, VA 23602. It focused on infrastructure resilience. The agenda is available on the Forum website. Role of the Ocean for SDGs: MARI is engaged in the development of a White Paper on the role of the ocean for the implementation and monitoring of the Sustainable Developments Goals (SDGs in Caribbean Small Island States. A workshop brought together governments and Earth observation providers in Saint Vincent and the Grenadines and took place in January 2018. For more information, see the Workshop Web Site. 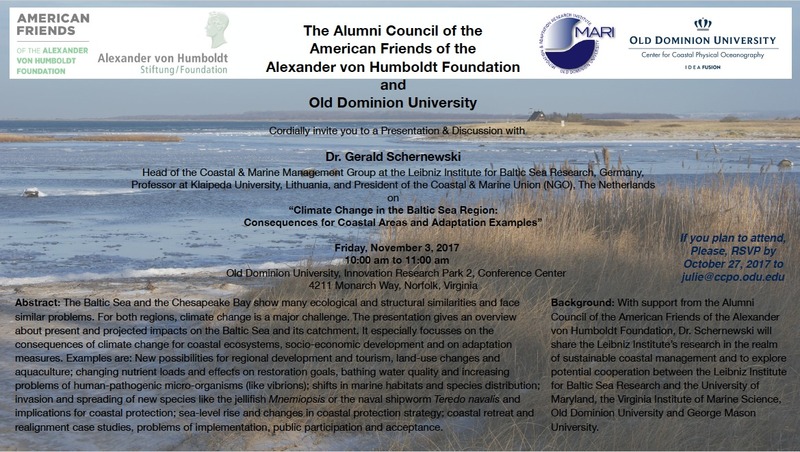 Humboldt Foundation Fellow talked about Adaptation around the Baltic Sea On November 3, 2017, Prof. Dr. Gerald Schernewski (read more) talked at ODU about “Climate Change in the Baltic Sea Region: Consequences for coastal areas and adaptation examples.” The abstract is available here. The event was organized by the Alumni Council of the American Friends of the Alexander von Humboldt Foundation and MARI at Old Dominion University. Hampton Roads Resilience Forum: A Watershed Event — The Hampton Roads Resilience Forum is a regional summit to advance economic development and public policy. It discussed how the region works with water. The event took place on August 22, 2017 at the Norfolk Waterside Marriott. More information is available here. See also the article by Jessica Williams. Virtual Student Foreign Service: The VSFS provided an unique oppportunity for students to engage in international projects during a virtual internship. Through the VSFS program, students can work on projects that advance the work of government on multiple fronts. Projects include helping counter violent extremism, strengthening human rights monitoring, developing virtual programs, engaging in digital communications, mapping, economic and political reporting, data analysis, graphic design, and app building. Students can choose projects from a wide variety of more than 32 federal agencies. The deadline for applications had been extended to August 2, 2017. GEO Blue Planet Symposium in College Park, MD: The 3rd Symposium of the Blue Planet Initiative, Oceans and Society of the Group on Earth Observations (GEO) took place on May 31-June 2, 2017 at the NOAA Facilities in College Park, MD, USA. Achieving Environmental Equity: A community roundtable organized by the Urban Sustainability and Equity Center in Richmond, Virgina on May 1, 2017, 6:00-8:00 PM, discussed local heat island patterns in the City of Richmond. Fifth GEOSS Science and Technology Stakeholder workshop: The 5th GEOSS Science and Technology Stakeholder Workshop on “Linking the Sustainable Development Goals to Earth Observations, Models and Capacity Building” was held on December 9-10, 2016, Berkeley, California, USA. For more information, see http://www.gstss.org/2016_Berkeley/. Hampton Roads Adaptation Forum: A Adaptation Forum took place on Friday, July 29, 2016 at the Old Dominion University Peninsula Higher Education Center (ODU PHEC). The topic was “The Latest in Sea Level Rise Science.” For more information, see https://sites.wp.odu.edu/HRAdaptationForum/. Annual Education Seminar of the Virginia Water Environment Association: The Seminar was held on May 12, 2016 in Richmond, Virgina, and it included an opening presentation on “Global and Climate Change and Sea Level Rise: Understanding and Meeting the Challenge from Local to Global Levels” by Hans-Peter Plag. The presentation is available as PDF. Hampton Roads Adaptation Forum: An Adaptation Forum took place on Friday, May 6, 2016 at Clark Nexsen in Virginia Beach. The theme was Planning for Resilience in Hampton Roads. See the Agenda. For more information, see https://sites.wp.odu.edu/HRAdaptationForum/. MARI/CCPO Seminar on April 10, 2016: Kirstin Dow, University of South Carolina was the speaker. See the Seminar Page for more details. 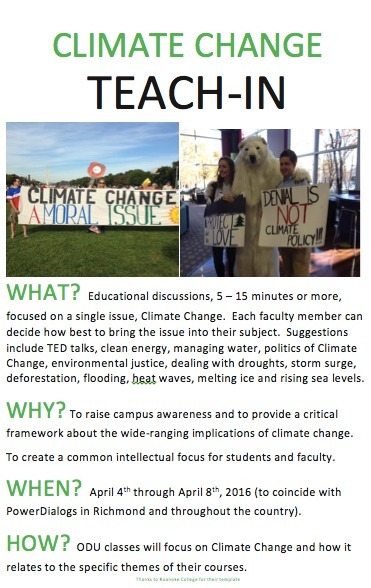 Teach-In: ODU teaching faculty was invited to participate in a Climate Change Teach-In on April 4-8, 2016. In each class the teachers were encouraged to dedicate at least 5 minutes of class time to a discussion of Climate Change and how it relates to the course or the field in general. The goal was to raise campus awareness and to provide a critical framework for the wide-ranging implications of this topic. It was hoped to create a common intellectual focus for a week to bring students and faculty into a collective dialogue. Read the flyer, see the poster, and have a look at the slides. MARI/CCPO Seminar on April 3, 2016: Donglai Gong, Virginia Institute of Marine Science, presented “Comparing the Impact of Arctic and Mid-Atlantic Submarine Canyons on Shelf-basin Exchange.” See the Seminar Page for more details. MARI/CCPO Seminar on March 28, 2016: Sara Maxwell, Dept. of Biological Sciences, ODU will be the speaker. See the Seminar Page for more details. THE 2016 RESILIENT VIRGINIA CONFERENCE: The 2016 Resilient Virginia Conference took place on March 22-23, 2016, in Richmond, Va. More information is available here. MARI/CCPO Seminar on March 21, 2016: Nicolas Cassar, Nicholas School of the Environment, Duke University was the speaker. See the Seminar Page for more details. MARI/CCPO Seminar on March 14, 2016: Sophie Nowicki, NASA Goddard Space Flight Center, was the speaker. See the Seminar Page for more details. 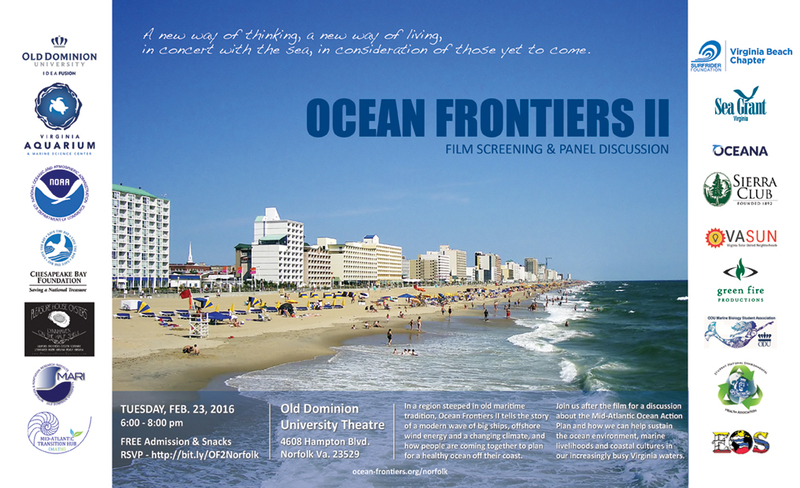 MARI is co-hosting the Ocean Frontiers II movie screening, an ocean planning community event at the Old Dominion University Theatre, 4608 Hampton Blvd., Norfolk, VA 23529, on Tuesday, February 23, 2016, from 6:00-8:00 PM. The screening of the film “Ocean Frontiers II” will be followed by a Q&A with a panel of experts. The purpose of the event is to inform and engage the public around ocean planning in the region - a timely effort as the draft Mid-Atlantic Regional Ocean Plan is set to be released for public review this spring. Ocean Frontiers II tells the story of New England’s efforts to create an ocean plan for the entire region, focusing in on an offshore wind energy development and their collaboration with fishermen, Native Americans and conservationists that became possible through the Rhode Island state ocean plan. We'll use this example of what took place in the northeast as a jumping off point for a post-film conversation about the challenges Virginia's waters are facing and how people can participate in the regional planning process now underway. RSVP to http://bit.ly/OF2Norfolk to save your seat. FREE parking across the street in Garage D. Free admission, snacks and refreshments. See also http://www.ocean-frontiers.org/Norfolk or the Facebook Page. You can preview the film at http://ocean-frontiers.org/of2. The Winter 2016 Hampton Roads Sea Level Rise/Flooding Adaptation Forum took place on Thursday, February 18, 2016 at the Chrysler Museum, 1 Memorial Drive, Norfolk. The meeting featured special guests talking about national exhibits as well as local opportunities and was followed by an evening networking reception. MARI/CCPO Seminar on February 8, 2016: Brad Muray, Duke University, was the speaker. See the Seminar Page for more details. MARI/CCPO Seminar on February 1, 2016: Richard Zimmerman, OEAS, was the speaker. See the Seminar Page for more details. MARI/CCPO Seminar on January 25, 2016: Gavin Smith, University of North Carolina, Chapel Hill, was the speaker at the seminar and talk about “Adapting to Climate Change: Lessons from natural hazards planning.” See the Seminar Page for more details. GIS 295 - Topics in Service Learning Geographic Information Systems (GIS) Sea Level Rise/Invasive Species Service Learning Course: The Virginia Space Grant Consortium (VSGC) is sponsoring a three-credit Sea Level Rise Service Learning course in partnership with Thomas Nelson Community College (TNCC), NASA Goddard Space Flight Center's Wallops Flight Facility (WFF), and the GeoTEd project (http://geoted.org). MARI is contributing to the course by advising the course team. Deadline for applications was December 1, 2015. See the course announcement for details. Collaborations for Community Resilience The Integovernmental Pilot Project (see the Center for Sea Level Rise web page for details) and ODU organized a meeting on community resilience on December 10, 2015, 8:30 AM - 3:30 PM, at the TED Constant Convocation Center. See the Inside ODU report or download the presentations here. MARI/CCPO Seminar on November 30, 2015: Jim Haluska, CCPO, ODU: Using High Temporal Resolution Imagery to Estimate Shoreline Movement Time Series for the Virginia Barrier Islands. See the Seminar Page for more details. MARI/CCPO Seminar on November 23, 2015: Mike Dinniman, CCPO, ODU: Ocean Modeling of Antarctic Ice Shelves: Why Do We Care and the Tricky Business of Modeling How It Might Change. See the Seminar Page for more details. MARI/CCPO Seminar on November 16, 2015: Robert Condon, University of North Carolina Wilmington: Jellyfish May Not be Increasing Globally. See the Seminar Page for more details. MARI/CCPO Seminar on November 9, 2015: Melissa Kenney, University of Maryland, Earth System Science Interdisciplinary Center and the Cooperative Institute for Climate and Satellites-Maryland: Multidisciplinary Insights to Solve Difficult Environmental Problems. See the Seminar Page for more details. MARI/CCPO Seminar on November 2, 2015: Johanna Rosman, Institute of Marine Sciences, University of North Carolina: Turbulence in the Coastal Ocean: So Important and Yet So Elusive. See the Seminar Page for more details. Hampton Roads Adaptation Forum on October 30, 2015: A Hampton Roads Adaptation Forum took place on October 30, 2015 at VMASC. The topic of this event was “Beyond Toolkits: Adaptation Strategies and Lessons.” See the agenda. The presentations are available at http://vaseagrant.vims.edu/forum-10-beyond-toolkits/. ULI Virginia (Hampton Roads) Resilient Region Reality Check: Rising Above the Waters: The Urban Land Institute in Hampton Roads organized the next event in the sequence of “Resilient Region Reality Checks” on September 16, 2015, from 9:30 AM to 3:00 PM in the Mariners' Museum at 100 Museum Drive, Newport News, VA 23601. For more information, see the 3RC page. Adaptation to Sea Level Rise: In the Opening Session at the WaterJAM 2015 held in Virginia Beach on September 15-16, 2015, Hans-Peter Plag addressed the question “Adaptation to sea level rise: protecting against, or preparing the coastal zone for, inundation?” See the associated article in the Summer 2015 Tap Into Virginia issue on page 41. The presentation is available as keynote and pdf file. Can we Continue to Live at the Edge of the Sea (with reference to future extreme events and climate change)? : On Monday, September 14, 2015, in the joint CCPO/MARI Seminar, Malcolm Bowman, School of Marine and Atmospheric Sciences, Stony Brook University, shared his thoughts on this important questions. For more information, see the Seminar Page. The Elephant in the Room - Quantitative Risk Analysis with an Uncertain Future: In the OEAS Seminar on September 10, 2015, Dr. Paul Smith, Arup, U.K., talked about risk analysis for extreme risks under large uncertainty, i.e., a situation that applies to future sea level rise. The seminar took place 3:00 - 4:00 PM in the OEAS building at ODU, room 200. Read the abstract and brief bio. Workshop on “Mitigation and Adaptation Research in Virginia”: MARI organized a workshop on August 11-13, 2015 at the Hilton Garden Inn, Suffolk, VA. The goal of the workshop was to review the status of mitigation and adaptation research in Virginia and to design a research agenda that can help to provide the practice-relevant knowledge the communities in Virginia need to meet current and future challenges. For more information, see the Workshop Page. Concert for Climate Action: A free concert organized by Sierra Club activists and over a dozen partner organizations took place on Thursday, July 30, 2015, 5:00 pm to 8:00 pm at WorkRelease, Norfolk Arts District, 759 Granby Street, Norfolk, VA 23510. Contact: Zach Jarjoura at (662) 292-5682 or zachary.jarjoura at sierraclub.org. Sea of Change Film Screening: The film about climate change and sea Level rise on Virginia's Coasts was screened on July 28, 2015; 6:30 to 8:00 PM in the Meyera E. Oberndorf Central Library. The Chesapeake Climate Action Network's VA Beach Action Team organized the event. After the film, a discussion about climate consequences in Virginia took place. Contact: Nate Levine Natel at chesapeakeclimate.org or 757-802-5201. ULI Advisory Services Panel, 2014. Norfolk Virginia: Resilience in Fort Norfolk: Assessing Risk and Protecting Value, Technical Report, Urban Land Institute. Yusuf, J-E, Covi, M., St. John, B., 2015. Hampton Roads Resilient Region Reality Check. Presentation. ULI, 2014. An Advisory Service Panel for Norfolk, Va. Urban Land Institute. Hampton Roads Flooding/Sea Level Rise Adaptation Forum: The forum took place on May 22 from 8:30 am- 3 pm at the VMASC Center 1030 University Blvd. Suffolk, VA 23435. Lunch and morning coffee and snacks was provided. The topic for the quarterly meeting was “Megaproject Protective Structures for Hampton Roads. The agenda is available here. 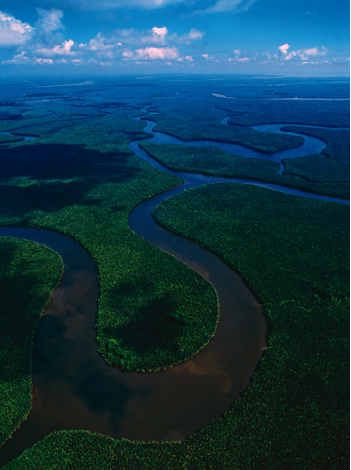 Preparing for the Journey to the Post-Holocene: At the meeting of the Explorer Club in Washington D.C. on Saturday, May 16, 2015, Hans-Peter Plag showed that humanity is on a journey to the Post-Holocene and discussed steps to prepare for this journey into the unknown. The presentation took place at the Cosmo Club in D.C. at 7:30 PM. The presentation is available for keynote and powerpoint. GEOSS Science and Technology Stakeholder Workshops: March 22-26, 2015 in Norfolk, VA. MARI supported the organization of two high-level workshops organized by the GEOSS Science and Technology Stakeholder Network of the Group on Earth Observations (GEO). The first workshop addressed “NAVIGATING SUSTAINABILITY ON A CHANGING PLANET” and the second Workshop focused on “CONCEPTS, TECHNOLOGIES, SYSTEMS AND USERS OF THE NEXT GEOSS.” For more information, including access to most of the keynote presentations, see 3rd Workshop announcement and 4th Workshop announcement. February 2015 Joint Societies Luncheon, ASCE Norfolk Branch: Wednesday, February 25, 2015 from 12:00 PM to 1:00 PM (EST) in Virginia Beach. Hans-Peter Plag spoke about “The Coastal Zone and Sea Level Rise: Protecting Against or Preparing for Inundation?” Download the presentation as keynote or powerpoint file (note that the ppt version does not have full graphical effects). Seventh Hampton Roads Adaptation Forum: January 23, 2014, 8:30 AM - 3:00 PM at the Virginia Modeling, Analysis and Simulation Center (VMASC), 1030 University Blvd., Suffolk, VA 23435. The meeting was hosted by the Hampton Roads Planning District Commission, Old Dominion University and Virginia Sea Grant. The focus for this meeting was on flood/storm surge modeling and visualization. For a summary see http://vaseagrant.vims.edu/storm-surge-models-at-hampton-roads-forum/. Community Event: The Arctic is Changing Rapidly. How Will Those Changes Impact Us? : During the Glen Gerberg Weather and Climate Summit, which took place in Breckenridge, Colorado, there was a Community Event on Wednesday, January 14, 2015, 7:00 PM MST (9:00 PM EST), with presentations by Dr. Jim White and James Balog. ODU organized a local event with live-streaming of the presentations and the possibility to ask questions. The ODU event was open for students, faculty, and staff as well as community members. More information is available here. Adaptive Planning for Flooding and Coastal Change in Virginia: Next Steps for the Commonwealth: December 5, 2014, Virginia Coastal Policy Clinic (VCPC), Williamsburg, VA. You can find videos of the conference and download the speakers' powerpoint presentations on VCPC's website here. Results from the live audience polling are also available on the website. A post-conference report is forthcoming. Appraisal Institute Chapter Meeting: At the Chapter Meeting of the Hampton Roads Appraisal Institute (HRAI) on September 9, 2014, Hans-Peter Plag, MARI/ODU, and Skip Styles, Wetlands Watch informed about the challenge of sea level rise for Hampton Roads. See the presentations by Plag (keynote) and Styles (ppt). TEDx Hampton Roads: Hampton Roads is full of talent, culture, and mixtures of ideas and perspectives. Within the "seven cities" live residents from around the globe, largely due to the transient nature of the connection with the military. To connect these ideas, to create progress in the growth of the area is essential for the seven cities - and tapping into the minds of the creative, innovative and makers, as well as hearing perspectives from the new, and the old will bring a collective voice to what is truly needed in Hampton Roads ... relevant progress. Tuk in the Arctic: This year's show of Science Alliance Live is “Tuk in the Arctic” and will be featured on June 5, 2014 at 6:30 PM; June 6, 13, and 20 at 6:30 PM; and June 7, 14, and 21 at 10:30 AM and 3:00 PM. Marine Technology Society 'TechSurge': “Technical Support for Coastal Resiliency,” on June 3-4, 2014, ODU's Ted Constant Conference Center in Norfolk, Virginia. May 19, 2014, 7:00 PM Civic League Meeting: The speaker will be Larry Atkinson, Professor and Eminent Scholar in the Climate Change and Sea Level Rise Initiative in the Ocean, Earth, Atmospheric Sciences at Old Dominion University. The Built Environment and Local Sea Level Rise: Anticipating Surprises: May 13, 2014, organized by the Construction Specification Institute, Norfolk; at Clark Nexsen, 6160 Kempsyille Cir., Norfolk. Speaker is Hans-Peter Plag, Director of the Mitigation and Adaptation Research Institute (MARI) and Professor in the Ocean, Earth, Atmospheric Sciences at Old Dominion University. Sea of Change: The documentary “Sea of Change” was screened at ODU on April 27, 6:30 PM, ODU Campus, Mills Godwin Building, room 101. After the screening, there was a discussion. April 22, 2014, 1:30 - 3:30 PM: Floodgate Project: Design of a Movable Gate Structure on the Elizabeth River for Flood Damage Mitigation in Norfolk, Portsmouth and Chesapeake; World Trade Center — West Wing, VPA, 6th Floor Board Room, 101 West Main St. Norfolk. Econference 2014: April 8, 2014, 8:00 AM - 6:00 PM, “8 Continuing Education Hours for a full days attendance at ECOnference,” Holiday Inn Norfolk-Virginia Beach Conference Center. 5th Hampton Roads Forum: Fifth Meeting of the Hampton Roads Sea Level Rise/Flooding Adaptation Forum, March 28, 2014. Skip Stiles: “Sea Level Rise, Coastal Risk, and Adaptation Options” on February 27, 2014; 12:20-1:20, Old Dominion University, Norfolk, Virginia, Perry Library, Conference rooms 1 and 2. ODUMUNC Faculty Forum 2014: The Touchy World of Climate Change and Sea Level Rise: Natural Science, Social Science, Philosphy and Pschology, February 22, 2014, 9:00 AM - 4:45 PM, Sheraton Waterside, Norfolk, Virginia, Riverwalk Room. Sea Level Rise Webinar: A Sea level Rise webinar took place on February 21, 2014, 12:00 - 1:30 PM. ACCESS-EU: Transatlantic Solutions to Sea Level Rise Adaptation: Moving Beyond the Threat; October 30-31, 2013; Old Dominion University in Norfolk, Virginia. Public Health Impacts: Wendy Ring presented on climate change and sea level rise impacts on public health and a panel discussion considered the impacts and options for Hampton Roads, October 25, 2013, at 6:30 PM at Webb Center, Old Dominion University in Norfolk, VA.
4th Hampton Roads Forum: Fourth Meeting of the Hampton Roads Sea Level Rise/Flooding Adaptation Forum, October 2, 2013. "Thin Ice" Screening: The Office of Intercultural Relations and the CCSLRI jointly organized a public screening of the documentary “Thin Ice”, which communicates the science of climate change. A panel discussion after the screening gave the audience the opportunity to discuss climate change and its implication with experts. September 26, 2013, 6:00 PM at the North Cafe, Webb Center, ODU. 3rd Hampton Roads Forum: Third Meeting of the Hampton Roads Sea Level Rise/Flooding Adaptation Forum, July 10, 2013, Virginia Beach.